thus the legend that the Mormon migrants named it after the prophet Joshua. Its unique and grotesque beauty found mostly in the Mojave Desert has attracted most passersby. Please click here to continue reading. Entry filed under: desert, hiking, Joshua Tree, nature, rocks, travel. Beautiful photos! 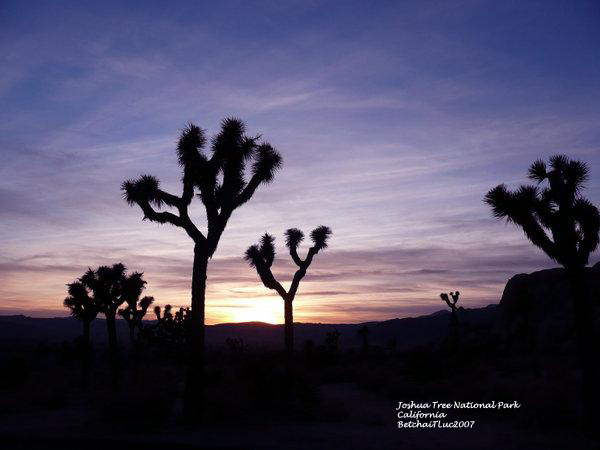 I’ve been to Joshua Tree National Park just once. When a friend got married in LA, a group of us headed there a day early, and spent the day before the wedding hiking in Joshua Tree. It was spectacular. You certainly shouldn’t complain about the low lying clouds; that shot looks amazing. I really like the shot of the pink sunset with the outline of Joshua trees. The last time I was in Joshua tree I went rock climbing. It’s really a great place for it. Great work on raising awareness of this fragile ecosystem. Thanks. You are right, even if we did not see the badlands from Key West, we were still rewarded by the pretty clouds and diffused sunlight. Thanks for stopping by.